* ... OSCAR CONNECTION: How many of you knew there was a strong Bakersfield connection to the Academy Awards? That's the word from Dennis Thelen, a partner at the LeBeau-Thelen law firm, who told me one of the winners of the "Best Original Song" Oscar used to call Bakersfield home. The song is titled "The Weary Kind"and is from the movie "Crazy Heart" featuring Best Actor winner Jeff Bridges. 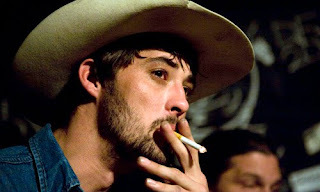 Ryan Bingham and T. Bone Burnette shared the Oscar for the song, and it turns out Bingham lived here for eight years before his family moved back to Texas and New Mexico. "Some will remember him as a very talented AYSO soccer player and Southwest Little League baseball player before he got interested in the guitar," Thelen said. Thanks for sharing, Dennis. * ... ANOTHER COMES HOME: I enjoyed a nice email exchange with reader Marie Parks who wanted to share the story of her son Jim Parks, yet another local product who went to college out of town, worked elsewhere but chose to return to our community. Jim graduated in 1989 from North High School, was an All Area varsity basketball player and a member of the National Honor Society. He graduated from Long Beach State (CSU Long Beach), worked in San Diego, married but decided to come back home. His wife, Melanie, is from Tehachapi and the couple just had their first child, a daughter named Mahaila. By the way, father Jim Parks coached at CSUB in the 1980s and this week will be inducted into the California Community College Coaches Association Men's Basketball Hall of Fame. As Marie said: "I am proud of both of my boys!" * ... COLLEGE BOUND: Reader Lisa Bell let me know that her daughter, Allison Bell, a senior at Centennial High School, is headed for Brigham Young University in Provo, Utah, this summer. Also, local Wells Fargo commercial banking vice president Michael Congdon (and his wife Lanette) report that daughter Lacey, also a Centennial senior, will be attending Baylor University. Congratulations to both these young women being accepted to these outstanding schools. * ... GET WELL EDDIE: I heard that local businessman Eddie Paine suffered a mild heart attack earlier this week. Eddie checked himself into Mercy Southwest Hospital after experiencing what seemed like indigestion and promptly received a heart stent. He's doing well and under doctor's orders to lighten up on the stress. Always easier said than done. Eddie is a longtime Bakersfield resident and his wife Maria is head of human resources over at Jim Burke Ford. Daughter Rachel is at Stanford University. Get well, Eddie. * ... THE BUZZ: It was disheartening to hear that our unemployment rate had jumped to 17.1 percent, a pretty clear signal that this long recession is far from over. There is no better barometer about the health of our economy than the number of folks out of work, and the release of this new number was like a dagger to the heart. Once you factor in those who are considered under-employed or have simply stopped looking for work, our jobless rate is well north of 20 percent. Think about that: one in every five people in Kern County is either out of work or earning too little to make ends meet. * ... BAKERSFIELDISMS: You know you're from Bakersfield when "One of your friends owns a house on a spot where you had field parties in high school. Roy Ashburn tells Inga Barks: "I am gay"